Analogue Output AC Output 0~2.0 V Peak Full Scale (Load Resistance: Above 10k). Warranty&Reture Policy Weight 181 g (Not Including Batteries). Data Output USB, RS-232, Bluetooth. 3-Axis Vibration Datalogger. The Datalogger: 95mm x 28mm x 21mm. CEM DT-178A. Acceleration Range: ±18g. Trigger Range: 0 to 18g (XYZ magnitude). Battery Life: About 1000 hours. Storage temperature and humidity: -10C~ 60C. 10%RH~75%RH. •Analogue Output:AC Output 0~2.0 V Peak Full Scale (Load Resistance: Above 10k). Provide “Bluetooth ™ data output” choice. •Battery Indicator:Low Battery Indicator. Manufacturer: FLUKE. 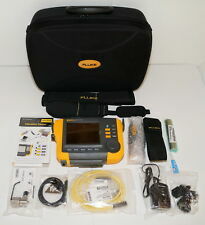 Use the Fluke 810 Vibration Tester to Vibration Tester with diagnostic technology. Overall vibration level allows you to quickly assess overall machine health directly from the diagnosis screen. 0.001-1.999mm(peak-peak value). storage capacity. 1 Handle Box. 1 Hanging Rope. 1 User Manual. Size: Approx. 176 54 25mm / 6.9 2.1 1.0in. Weight: Approx. CF values range from 1 to 16. As the bearing condition worsens, the CF value increases, ensuring the user is easily able to recognize the severity of the problem. To make things even simpler, Fluke has also included a four-level severity scale that identifies the bearing health as Good, Satisfactory, Unsatisfactory or Unacceptable. Model: GM63A. 1 x User Manual. 1 x Storage Case. 1 x Detector Probe(L). Product gallery. 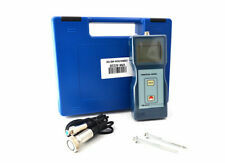 447-001 - Handheld Human Vibration Analyzer FW Version 3.0.1, HW 1.5, serial number 610855. BZ-5623 - Vibration explorer CD Version 2.0.1. Simultaneous display of X, Y and Z axes'vibration, as well as total value. Piezoelectric accelerated sensor. 0.001-1.999mm(peak-peak value). Model: SW-65A. battery working life. If you do not receive our reply within 48 hours, pls. If you are satisfied with our service, pls. Enter the country of dispatch. -cover for parts. Make sure you read the following to avoid any. to your country. Standard or expres. Other countries : request. Teflon Chamber In Hydrothermal Synthesis Autoclave Reactor PTFE Lined Vessel. Used in Hydrothermal Synthesis Autoclave Reactor, high temperature corrosion and wear resistance. we also have the TEFLON chamber of 5ml，10ml，15ml，25ml, 50ml,100ml,150ml, 200ml,250ml，300ml，400ml，500ml. Analogue Output AC Output 0~2.0 V Peak Full Scale (Load Resistance: Above 10k). Accuracy ± ( 5%n 0.2 ). USB, RS-232 data cable with software. Optional Accessories Manual Book. Carrying Case. Probe (Spherical). All the problems can be solved. Just do not open case. Model: AS63B. 1 User Manual. Temperature accuracy: ±2℃. Temperature range: -10℃~80℃. Low battery indication: 6.4V±0.2V. Model: GM63B. Selective vibration characteristic. Vibration pickup. Low battery indication, auto turn off function, LCD back light function, maximum value hold function, temperature unit C°/F°selection. 1 Hanging Rope. 0.001-1.999mm(peak-peak value). If you do not receive our reply within 48 hours, pls. If you are satisfied with our service, pls. 1 Handle Box. 1 User Manual. Size: Approx. 176 54 25mm / 6.9 2.1 1.0in. Analogue Output: AC output 0~2.0V peak full scale. value hold and low battery indication. ( Cable and software is not included). Cable and software for RS232C. Optional accessories Operation manual 1 pc. B&K Sensor TYPE 4391 1477894. Model: GM63B. Selective vibration characteristic. Low battery indication, auto turn off function, LCD back light function, maximum value hold function, temperature unit C°/F°selection. Vibration pickup. UT312 Split style. Vibration Acceleration(O-P). Vibration Velocity （ RMS ）. Frequency response:10 ～ 1500Hz,Amplitude error:≤±5%. Frequency response:10 ～ 1500Hz, Amplitude error:≤±5%. Frequency response:10 ～ 500Hz, Amplitude error:≤±5%. Low frequency acceleration. high frequency acceleration. 0.001-1.999mm(peak-peak value). working temperature. storage temperature. beyond four hours without breaks. 0.1-199.9m/s2(peak value). If you do not receive our reply within 48 hours, pls. Model: GM63B. 10Hz - 1KHz (LO) 1KHz - 15KHz (HI). 10Hz - 1KHz (LO). Selective vibration characteristic. Low battery indication, auto turn off function, LCD back light function, maximum value hold function, temperature unit C°/F°selection. Model: AS63A. Different vibration frequency selection. Vibration pickup. Low power indication function and auto power-off function. Equipped with AC signal output interface. LCD backlight for easy reading. Built-in accelerators. This unit has a built in datalogger and battery so does not need to be connected to a PC to monitor vibration. 3.6V lithium battery and clamshell included. High speed download via USB 2.0. People always bought together with. Due to the quality differentiation of monitors and lighting effect, the picture may not reflect 100% the actual color of the item. 1 Piece User Manual. - 1KHz~15KHz (HI). LCD display with backlight for easy and clear checking ； ℃/℉ switch function; Auto power-off fuction. - Working Humidity: 20-90% RH. - Working Temperature：0-45 ℃. - Power：3x AA battery（Not included）. Wide frequency range (10Hz~10kHz) in acceleration mode. Analogue Output AC Output 0~2.0 V Peak Full Scale (Load Resistance: Above 10k). Bluetooth data out put with software. Warranty&Reture Policy. 1 Detector Probe(L). 1 Detector Probe(S, equipped on the main unit). LCD display: 3 1/2 digits displayGeneral Characteristics 0.001~1.999 mm (P?P). Product Size: 17 6.5 3.5cm / 7 2.7 1.4in. Acceleration: 0.1-199.9m/ s2 (peak value). Speed: 0.1-199.9mm/s (effective value). Speed: 15Hz - 1KHz (LO). Model: HT-1201. Color: Grey. If you do not receive our reply within 48 hours, pls. If you are satisfied with our service, pls. Place the unit onto the motor or surface to be monitored for up to 24 hours, then transfer it to a PC for analysis using the supplied software. USB connector and software for graphical analysis of results on your computer. Analogue Output AC Output 0~2.0 V Peak Full Scale (Load Resistance: Above 10k). USB, RS-232 data cable with software. Optional Accessories Manual Book. Carrying Case. Probe (Spherical). Probe (Cone).